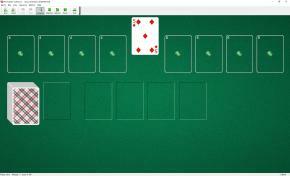 Above and Below Solitaire uses two decks (104 cards). Each deck is shuffled separately. You have 4 tableau piles and eight foundations. The first card dealt from the stock pile ("indicator") is used to define the starter cards of the foundations. The seven other cards of the same rank are piled on top of the first "indicator" during play as they become available.Four cards one rank lower then indicator (one of each suit) are moved to the left four foundations as soon as they appear during play. Four cards one rank higher then indicator (one of each suit) are moved to the right four foundations as soon as they appear during play. To build the left four foundations down in suit, and the right four boundations up in suit, wrapping from King to Ace and from Ace to King as necessary, until each foundation pile contains 12 cards. Then each foundation is finished with an indicator of the same suit. Begin turning over cards from the stock pile to the waste.The top cards of tableau piles and the waste pile are available to play. You can move cards from the waste pile to the foundations and tableau piles. There are no restrictions on placing cards from the waste pile onto the tableau piles. Only the top card of each pile is available for play on the foundations. You cannot move cards from pile to pile. When the stock is empty, click on it to pick up the tableau piles. The skill in this game is to decide which tableau pile to put each card on. You shouldn't block lower cards by the higher ones, unless it is absolutely necessary.